The southernmost constellation of the Zodiac – Scorpius the Scorpion – lurks low in the evening sky tonight. You can recognize it easily because the moon is moving through this part of the sky. 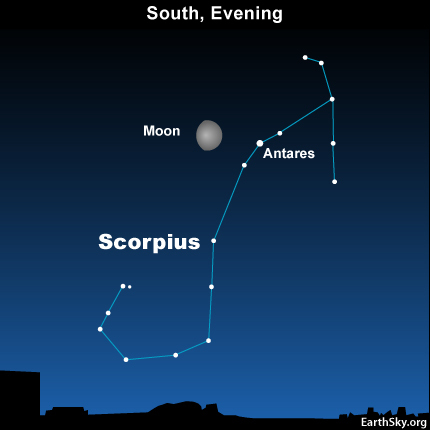 You will find tonight’s moon near Antares, the star that represents the Scorpion’s Heart. From the perspective of mid-northern latitudes, the Scorpion comes up in the southeast in evening twilight now and skitters near the southern horizon during the evening hours, its fishhook-shaped tail scraping along the ground. The Scorpion’s nighttime presence tells stargazers in the northern hemisphere that Orion the Hunter – the gem of all constellations – is nowhere to be found in the night sky. According to star lore, Orion – a man of great beauty and a gifted hunter – boasted of his great prowess and was convinced of his own invincibility. He finally met his match when the gods made sure that the Scorpion’s sting would put Orion to death. To immortalize this story about Orion and the Scorpion, the gods turned the two archenemies into constellations. However, they decided not to place these two combatants into the same sky together – so, to this day, one of these constellations never enters into the stage of sky until the other one has already left it. Of course, there is a moral to this timeless tale, often overlooked by people of great beauty and inherent ability. Our talents are given to us by the gods. To appreciate these gifts, and to make good use of them, repays our debt to the gods. However, to brag about or to abuse a god-given endowment is to incur the gods’ displeasure. This story – almost certainly – could only have originated in the northern hemisphere. In the southern hemisphere, New Zealanders see Orion climbing into the eastern sky in the wee hours before dawn right now – and at the same time, see the Scorpion’s stinger stars jutting up into the southwest sky. Not too surprisingly, many native Polynesians associate a different story with the constellation Scorpius, viewing its graceful J-shaped curve of stars as a Magic Fishhook. Previous Story: Vote for Justin Smith for Larimer County Sheriff!